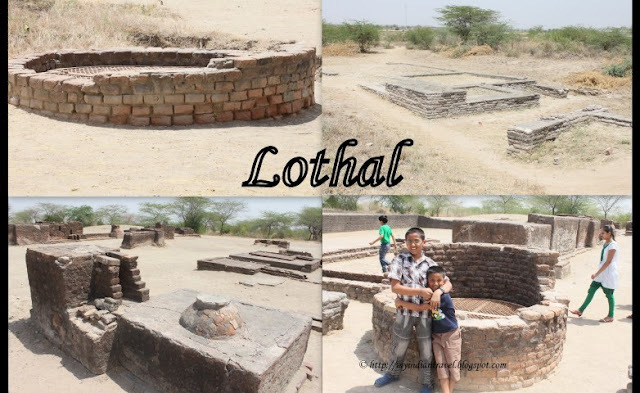 Lothal in Gujarat has a history that is more than 4000 years old. It is one of most important city during the ancient period of Indus valley civilization. This remote village is at a distance of around 85 kms from Bhavnagar and Ahmedabad in either direction. "Lothal" when translated into local language Gujarati means "The City of Dead". It is here we see the one of the Worlds ancient dock. In the ancient times this city was a port city that traded in beads, gems and valuable ornaments reaching far of places. The Archaeological Survey of India has started excavation at this site in 1955 and what we discover is city with excellent Town Planning. Harappan Civilization created planned town and port after earlier village was destroyed by flood around 2300 BCE. Apart from this there is also a Archaeological Museum displaying artifacts excavated from this site. Visited here last year. Amazing remains of a thriving civilization 2500 years ago. Interesting to see how cities of the past have disappeared.....thanks for sharing! 4000 years old...I love ancient settlements...they had developed so much almost forgotten. Hard to imagine that it was once a main port. Looks less greenery is planted. A city with a history that long is amazing, especially by the standards of my country. Hi Rajesh, What an interesting excavation of an ancient town. It doesn't look busy with tourists. Your boys are growing! Amazing , Thanks sharing, Nice photos. These old sites hold so many stories. The area looks very dry and dusty. Is it now abandoned? great shots and story behind them. A rather dreary name for a completely fascinating place! Oh such an interesting post. Now I'd love to go there as well as so many other places you've introduced me to! So fascinating to think of a thriving civilization .... People living and working and going about their daily lives, so very long ago. It's great to see these places and the museums of artifacts. Makes it seem more real than just studying or reading about it. It looks like a really interesting place to visit. Interesting name, the first photo really gives credence to its name. Great photo's and such an interesting country to be ! What fun to walk about the old ruins and contemplate what it might have been like 4000 years ago. Fascinating history as always and wonderful photos ~ thanks. I am fond of ancient ruines, and I always want to know the history of them. India was far more civilized than we in Europe! You do a great job to tell us about the ancient temples and holy places every week. Wow! I'd just come from reading a post in which a city was established in 1407. That is a baby compared to this village. Astounding. What history is here! It will be fascinating to see what the excavations will uncover in time. How exciting to see the past emerge from the dust. What a wonderful excavation to feed the imagination and put oneself back in time. Birds will always bring life to a place. Interesting photos..Had recently read a post regarding this place.. in my 'visit to places' wishlist. i would love to visit this place, this type of ancient places attracts me a lot. Thanks for sharing with the history and beautiful shots. Title of the post is so enchanting. City of Dead. Nice pictures.